TMNT Entity: The Return of... Monsterex! 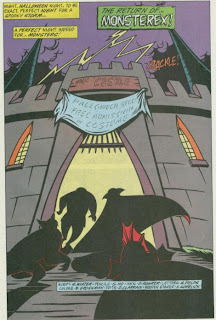 It’s Halloween and at the Magic Castle Amusement Park, anybody wearing a costume gets in free. Down in the sewers, the Turtles, Ninjara and Splinter are using a shortcut through the basement of the park’s wax museum. 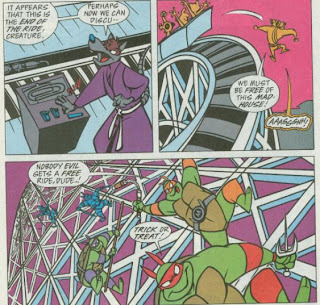 Ninjara is excited to visit an amusement park for the first time and asks if the Turtles have ever been to this one before. Leo then regales her with the story of their battle with Monsterex, which ended when the creature fled from the light of day into the harbor bordering the park. Speak of the devil: As they enter the torture chamber exhibit, they find Monsterex in all his horrific glory! Except he isn’t moving. Upon closer inspection, it appears that Monsterex has been encased in dry mud and rendered paralyzed all this time, then mistaken for a wax statue and left on display. Sadly, Donatello inspects just a little too closely, knocking Monsterex over with his bo staff and shattering the mud. Enraged, Monsterex flees into the amusement park to cause mayhem for the Hell of it. Luckily, it’s Halloween and all the tourists mistake him (and the Turtles) for a guy in a costume. The sight of so many “fake” monsters further enrages Monsterex and the Turtles vow to stop him before he hurts anybody. Their chase leads through a funhouse, up a Ferris wheel and along a rollercoaster track. All the while, Monsterex screams that the Turtles are the real monsters. The chase leads to a tilt-o-whirl where Ninjara and Splinter attempt to stop the monster by pulling the brake on the ride. All they succeed in doing is flinging the Turtles in every direction while Monsterex escapes unscathed into a house of mirrors. Inside, the Turtles are unable to figure out which Monsterex is real and which is the reflection. As dawn approaches, Ninjara realizes that they don’t have to bother. She tells the Turtles to throw their weapons at the skylight, shattering it and letting the sunlight in. The light strikes Monsterex, melting him into a puddle of water (because he's partly comprised of the Wicked Witch of the West). With all said and done, Raph feels slightly disturbed that Monsterex kept calling them the “real monsters”. Splinter, though, reminds his sons that despite their unusual appearance, they understand the concept of good and evil, right and wrong. And so long as they do, they will never be “real monsters”. 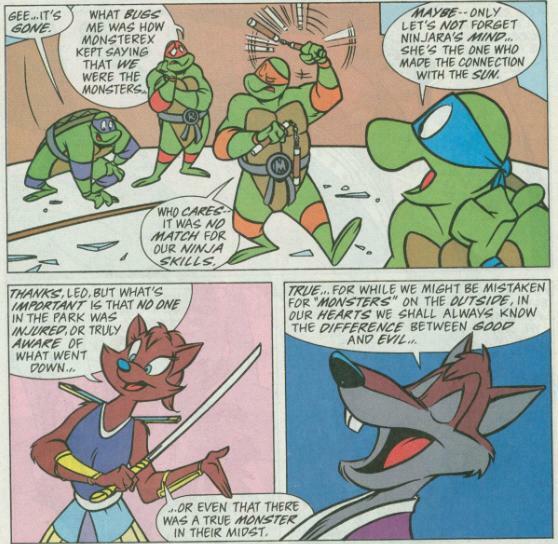 *Chronologically, I would place this story between the prologue of TMNT Adventures #41 and TMNT Adventures #42. Mainly because that is the closest narrative gap corresponding to when this issue was published, but also because Ninjara shows an unfamiliarity with American culture and entertainment. In issue #41, Raph was shown taking Ninjara to museums and teaching her about American pastimes, so this seems to fit in around there. *Bookwurm last appeared in April O’Neil: The May East Saga #3. *The Turtles battled Monsterex in “The Night of Monsterex”. Well, this was a tedious story if there ever was one. 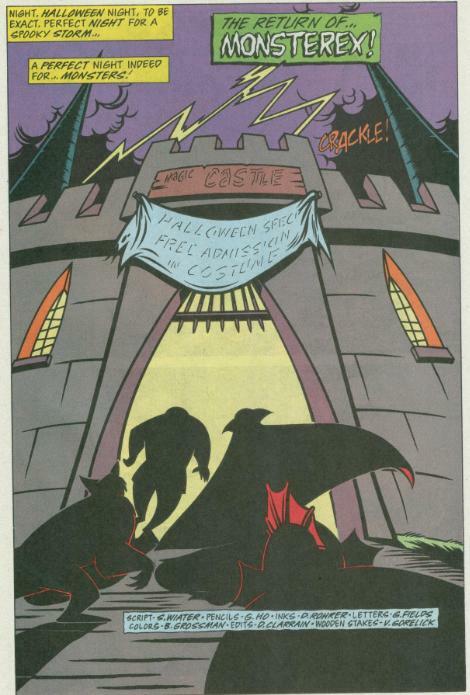 The Turtles visit the amusement park, free Monsterex by accident and then the entire issue is just a dull chase scene through the various rides. I can’t imagine why Monsterex would even bother fleeing, as he was shown to be invincible to everything but the sun in their previous encounter and handily thrashed the Turtles in battle. Delaying their fight only served to kill time before dawn and facilitate a hasty conclusion. And speaking of that conclusion… what? Break the skylight so that the sunlight can come in? It’s a skylight! The sunlight should already be coming through! Light passes through glass, people! 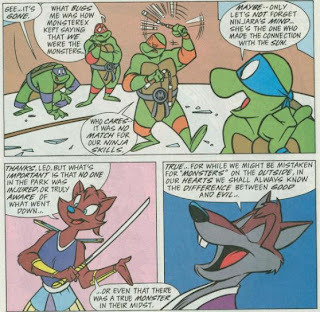 It’s just another typical problem of Stanley Wiater’s stories in TMNT Adventures; he rarely seems to think them through and they're largely incoherent. And that’s even after Murphy (Clarrain) puts them through the “editing” process, the extent of which I can only imagine. I mean, the running banter between the Turtles and Monsterex keeps hinting at some unrealized “depth”, as Monsterex treats the Turtles as his persecutors, calling them the “real monsters” over and over. But he also goes on about terrorizing people and how angry he is and then he dies and just what the Hell was the moral supposed to be, again? If this story was intended to have a lesson about superficial appearances then it’s incredibly, embarrassingly half-baked. Again, something typical of Wiater stories. What saves this whole shebang is the art by Garrett Ho. 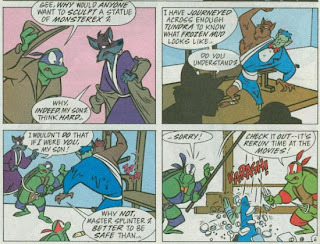 He’s refined his style by this point in TMNT Adventures and it really is lively, electric and dare I say it: very, very cute. I particularly like his take on Ninjara, which may be my favorite rendition of her in the whole series. Other artists try to accentuate the “sexiness” of the character, which is just sort of gross, but Ho just makes her cute and spunky like a Disney cartoon. His layouts are also really impressive, especially that page where the Turtles travel up through the sewer and basements of the old wax museum (even if the dialogue bubbles have to be applied and read in reverse of the visuals). He does his best with the whole chase scene and gets some dynamic shots in to liven up this otherwise dull story. 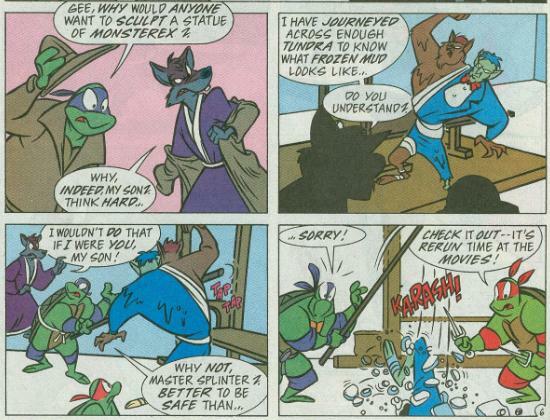 “The Return of… Monsterex!” is a muddled mess in regards to the script, but the fun and frantic art salvages the thing from an F. After he left the Mighty Mutanimals ongoing, Ho’s impact on TMNT Adventures became less and less, so it’s always a pleasure to see him make a surprise contribution in the Specials. I think G Ho's art is how i would envision a Mighty Mutanimals cartoon. Its kind of a simplified version...similar how the Slimer cartoon featured a simpler look to the character, or how Tmnt Fast Fwd simplified the Tmnt2k3 artwork. Also...could you post the prologue page? :-). Love me some Allan art. I am a man of contradictions!